KINGSTON, Jamaica, Oct. 10, 2018 /PRNewswire-HISPANIC PR WIRE/ — The most honorable Andrew Holness, Prime Minister of Jamaica hosted the Norman Manley International Airport Public-Private Partnership Execution of the Concession Agreement to Grupo Aeroportuario del Pacifico (GAP). 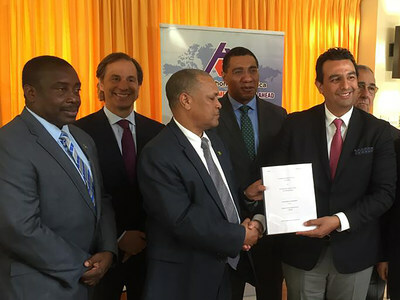 “We will collaborate with the government of Jamaica in identifying tourism development opportunities and possible investors from Mexico; as well as explore potential growth for new resorts, tourism facilities and time-share business in parts of the country where the connectivity provided by the airport could be a catalyst”, mentioned Raul Revuelta, Chief Executive Officer of the Group during the ceremony in which participated Hon. Robert Montague, Minister of Transport & Mining. Guadalajara and Tijuana, serving the main metropolitan areas. Mexicali, Hermosillo, Los Mochis, Aguascalientes, Guanajuato and Morelia, serving mid-sized and developing cities. La Paz, Los Cabos, Puerto Vallarta, Manzanillo and Montego Bay, serving some of the leading tourist destinations. In Mexico, the airports are owned by the Mexican government and were assigned 50-year concessions as part of a national initiative to privatize and improve the quality and safety of the country’s airport services. In the last 18 years, GAP has invested over $1.2 billion USD in the airports. During 2017, the airports of the Group managed 40.7 million passengers. In April 2015, GAP assumed operational control of the Sangster International Airport in Montego Bay.